Elias Hazineh, former president of "Palestine House," calls for Israelis to be given a 2-minute warning to leave their homes "or be shot." The former president of "Palestine House," a Canadian NGO accused by the government of showing a "pattern of support for extremism," has called for the violent ethnic-cleansing of all Jewish Israelis Saturday. In the video below, Elias Hazineh can be seen addressing a crowd of anti-Israel activists in Toronto during the annual Al Quds Day march. "We have to give them an ultimatum," he said of Israelis, "you have to leave Jerusalem; you have to leave Palestine..."
"We say get out or you're dead. We give them two minutes and then we start shooting! And that's the only way they'll understand!" Nearly one million Jews were ethnically-cleansed from Arab states following the establishment of Israel, and today make up around half of the entire Israeli population. Elias finished his speech by calling for war against the Jewish State. "I am reminded of this verse from the Quran: 'And prepare against them whatever you are able of power and steeds of war' - that's the only thing that they'll understand!" Al-Quds Day has been marked annually around the world since 1979, when it was established by Iranian Supreme Leader Ayatollah Khomeini to express support for “the liberation of Jerusalem" by Muslim forces and to call for the destruction of the State of Israel. This year's gathering saw a mixture of around 300 Shi'a Islamists, radical leftists, and a small group of Neturei Karta activists, who were apparently unfazed by the event taking place on Shabbat (the Jewish Sabbath). 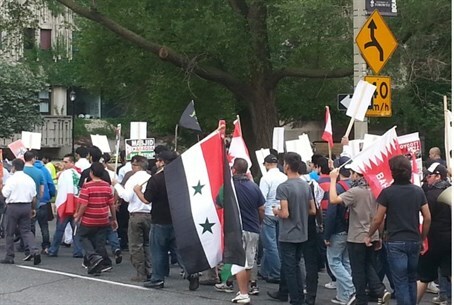 Demonstrators proudly waved the flags of Iranian, Syrian and Hezbollah flags, alongside pictures of Ayatollah Khomeini. The annual rally took place north of the Ontario parliament building this year, after the provincial government rejected a request by the organizers to hold it in front of the parliament building itself, as they had done in previous years. Sunni Muslims apparently boycotted the rally, most probably due to the war crimes carried out by the Assad regime of Syria with the full military support of Iran and their Lebanese proxies Hezbollah, against the largely Sunni opposition there.